Wagadoogoo!, Inc was founded not only as a mechanism for creativity and learning, but also as an organization to give back to the community. Our customers work with us to provide for programs that aid cultural awareness and global knowledge in children of all ages. As Wagadoogoo! grows in terms of both products and geographic territories, we hope to grow our financial gifts appropriately. Our focus is on cultivating new relationships with potential core partners as we grow. If you represent an organization that meets the giving criteria for Wagadoogoo!, we are interested in hearing from you. Please contact us with an explanation of your organization and full contact information including the organization's name, web address, the contact's name, and their telephone number. 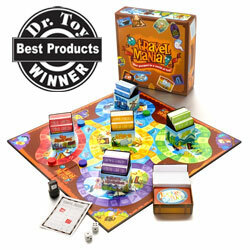 In Travel Mania, winner of Dr. Toy's Best Products Award, players travel around the board and must collect five visas and passport stamps — one from each of five continent groups — to win the game. 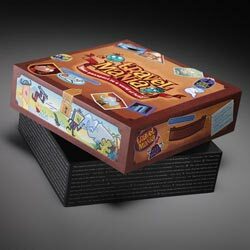 Travel Mania is unique in that as few as two players to as many as twenty can play (in teams, of course). The game can be finished in about an hour, or play can be extended if desired. Luck, smarts, and random chance all meet to create a Travel Mania winner. 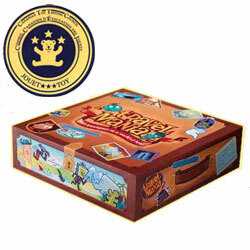 Travel Mania also won the highest rating from the Canadian Toy Council. Click here to see some of the newer products Wagadoogoo! Inc. has shared with ToyDirectory and TDmonthly Magazine. �1996-2005 ToyDirectory.com, Inc.(R) All rights reserved. All logos, brands, and product names listed are trademarks and property of their respective holders.